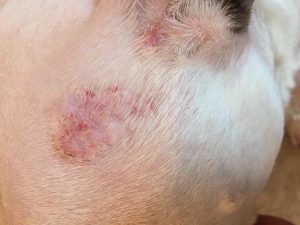 Description – Phoebe, a 5 year old female spayed bulldog mix, presented with a large erosive dermal lesion following cessation of prednisone therapy for severe environmental allergies. Although treatment with corticosteroids improved Phoebe’s skin, she developed iatrogenic Cushing’s disease and hepatopathy necessitating discontinuation of prednisone. Attempts at treatment with antihistamines, antibiotics, antifungals, and shampoos were unsuccessful in treating the non-healing skin lesion. Finally, a biopsy provided a diagnosis of calcinosis cutis. Acupuncture was prescribed for both the allergies and the calcinosis cutis. Summary – After six acupuncture treatments, Phoebe’s calcinosis cutis lesion completely resolved and overall pruritus decreased. 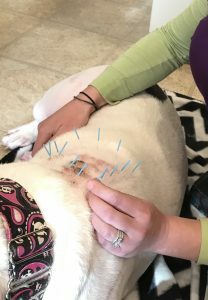 Phoebe’s guardian reported an increase in activity and improvement in overall attitude, and maintenance acupuncture continued for long-term control of Phoebe’s allergies. 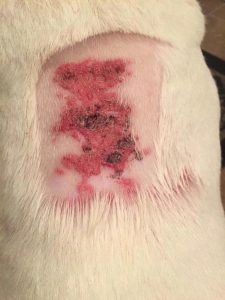 Phoebe, a 5 year old female spayed bulldog mix, presented on 11/15/17 for scratching, papules and pustules over entire body, patchy alopecia, and a 10x14cm erosive dermal lesion in between her shoulder blades. Phoebe had been previously diagnosed with environmental allergies, atopic dermatitis, and otitis externa secondary to atopy. Environmental allergies, including mites, molds, weeds, trees, and grasses, were initially diagnosed based on a regional allergen blood panel in November 2015. 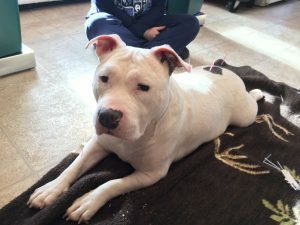 At that time, the owner reported that Phoebe was shaking her head constantly, rubbing her face on the carpet, and had small red lesions on her ventral abdomen. Various medical therapies were prescribed to control her atopic dermatitis and otitis externa secondary to atopy over a one year period. Immunotherapy, antihistamines, Apoquel, and a diet trial improved but did not resolve her clinical signs. In November 2016, prednisone was prescribed in an attempt to control the pruritus, recurrent pyodermas, and otitis externa. Phoebe’s response to steroids was excellent – the pruritus, secondary pyodermas, and otitis externa resolved. However, attempts at tapering and eliminating prednisone resulted in immediate recurrence of pruritus. Internal organ function was monitored routinely at 4 months, 6 months, and 9 months following initiation of long-term steroid therapy. On these panels, it was noted that her ALT (alanine transaminase) and ALP (alkaline phosphatase) were consistently mildly elevated, but no other abnormalities were noted. Phoebe remained clinically normal until 11 months after initiating prednisone therapy. On 10/12/17, Phoebe presented for lethargy, severe muscle wasting, pot belly appearance, and inappetance. A chemistry panel at that time revealed moderate to severe elevations in all liver values (ALT, AST – aspartate aminotransferase, ALP, GGT – gamma-glutamyltransferase). Prednisone was tapered, and s-adenosylmethionine (SAMe) was initiated. Phoebe’s physical appearance began to improve after discontinuing the steroids; however, her owner began noticing increased pruritus. Phoebe presented on 11/15/17 for pruritus especially of the feet and ears; papules and pustules on her trunk, ventral abdomen, and distal limbs; and a 10x14cm erosive dermal lesion in between her shoulder blades with alopecia, scabbing, and hyperemic thickened skin; this lesion was pruritic as well. On 11/15/17, Phoebe weighed 69 pounds and her temperature was 99.7. Her physical examination findings included scattered circular regions of alopecia along her caudal trunk; generalized erythema; 2.5cm round raised scaly white lesion on her left cranium; 10x14cm erosive dermal lesion between her shoulder blades with alopecia, scabbing, and hyperemic thickened skin; and hyperemic, malodorous horizontal and vertical ear canals bilaterally containing yellow debris. Global muscle atrophy was prominent. Phoebe’s myofascial exam revealed taut bands in her cranial dorsal cervical neck bilaterally, and tenderness to palpation and trigger points in the longissimus thoracis and longissimus lumborum muscles bilaterally. Her itchiness may be related to her underlying myofascial dysfunction as she scratches herself after needles are inserted into trigger points in the longissimus thoracis and longissimus lumborum muscles and the areas of tension within these muscles. She also had warmth over her cranial lumber and sacral spine. Cytology of her otic debris revealed yeast and epithelial cells. Cephalexin was prescribed for pyoderma and Otibiotic Ointment for yeast otitis. The owner declined diagnostics on the dorsal dermal lesion at that time; in the following two weeks this lesion expanded and became more erosive. On 11/28/17, an incisional biopsy was performed, and histopathology provided a diagnosis of calcinosis cutis. BL 10 was chosen bilaterally to relieve taut bands found in the longissimus cervicis muscles. Points along the inner BL line between BL 11 and BL 25 were chosen to alleviate tension palpated in the longissimus thoracis and longissimus lumborum muscles bilaterally. SI19 was chosen to improve and resolve Phoebe’s bilateral otitis by stimulating the facial and trigeminal nerves and increasing blood flow to the area. Points surrounding the non-healing lesion were used to increase blood flow to the area and to stimulate thoracic spinal nerves to aid in healing. Bai Hui was chosen to stimulate the peripheral and autonomic nervous systems and to help relax Phoebe during her treatments. Phoebe would not allow me to use points around the smaller non-healing lesion on her head so LI 4 was used bilaterally as a peripheral point to aid in healing of lesions on the head and to stimulate the radial nerve to reflex up to the rostral ventrolateral medulla to modulate the autonomic nervous system and help with immune/inflammatory issues and skin disorders. ST 36 was used bilaterally to stimulate the fibular nerve which reflexes to the nucleus tractus solitarius to modulate the autonomic nervous system – parasympathomimetic effects – which has anti-inflammatory effects and helps balance the immune system, and neuromodulate the circulatory system. GV 20 and GV 14 stimulate cervical and cervicothoracic nerve roots, respectively, to aid in relaxation. GV 14 and LU 7 stimulate the cervicothoracic nerve roots and radial nerve to speed the healing of immune/inflammatory issues and skin disorders. Large erosive plaque-like dermal lesion: vasculitis, furunculosis, dermatophytosis, necrotizing fasciitis, systemic lupus erythematosus, demodectic mange, sarcoptic mange, cutaneous lymphoma, erythema multiforme, thermal burn, calcinosis cutis. Pruritus: Superficial pyoderma, folliculitis, furunculosis, dermatophytosis, thermal burn, demodectic mange, sarcoptic mange, lupus erythematosus. Otic debris: Bacterial otitis externa, yeast otitis externa, ear mites. Calcinosis cutis, yeast otitis, pyoderma, malassezia pachydermatis. Phoebe’s owner opted for an incisional biopsy and histopathology after treatment with antibiotics for two weeks did not improve the erosive plaque-like lesion; in fact, the lesion worsened during this time. An incisional biopsy was performed on 11/28/17, and the microscopic findings were characteristic for calcinosis cutis. Cytology was performed on her other hyperemic skin lesions which revealed increased numbers of cocci and yeast; this confirmed the diagnoses of pyoderma and malassezia pachydermatis. Cytology of the ceruminous otic debris revealed increased numbers of yeast and epithelial cells bilaterally; this confirmed a diagnosis of yeast otitis. Dry needling of the following points was performed: GV 20, GV14, Bai Hui, SI 19 bilaterally, BL 10 bilaterally, “circle the dragon” (many points around the large non-healing lesion), ST 36 bilaterally, LI 4 bilaterally, LU 7 bilaterally, several BL points bilaterally along the thoracic and lumbar spine – BL 18-BL 28. GV 20, GV 14, and Bai Hui were used for central nervous system, sympathetic regulation. SI 19 was used bilaterally to help speed the healing of Phoebe’s otitis. BL 10 was used bilaterally to release the myofascial restriction in this area. ST 36 was used bilaterally as a point of peripheral stimulation, autonomic nervous system regulation, and as a point to aid in the healing of skin disorders. ST 36 bilaterally, LI 4 bilaterally, and GV14 were used as points for Phoebe’s immune and inflammatory issues. LI 4 was used bilaterally for sympathetic regulation and as a point to aid in the healing of skin disorders. LU 7 was used bilaterally as a point to aid in the healing of skin disorders. Many inner BL line points from BL 11 – BL 25 were used bilaterally to relieve tension and pain locally (found on myofascial palpation exam) between the longissimus thoracis and iliocostalis thoracis, and longissimus lumborum and iliocostalis lumborum. These points were also chosen to help relieve tension regionally from pruritus. Needles Used: Seirin J-type 0.16mmx30mm, 0.20mmx30mm, and 0.23mmx30mm. Phoebe received her first five acupuncture treatments every 3-9 days; her treatment dates were 12/4/17, 12/8/17, 12/14/17, 12/20/17, and 12/27/17. Based on her results, her owner and I decided to continue her treatments every other week. Phoebe’s sixth treatment was on 1/10/18. At these appointments, Phoebe also received laser therapy over the non-healing calcinosis cutis lesion; longissimus and iliocostalis muscles along the entire spine; and other areas of skin irritation including ventral thorax, ventral abdomen, lateral thorax bilaterally, lateral abdomen bilaterally, dorsal/palmar surfaces of forelimbs bilaterally, and dorsal/plantar surfaces of hindlimbs bilaterally. Phoebe’s calcinosis cutis lesion completely resolved following six treatments with acupuncture and laser. Interestingly, antimicrobial therapy initiated 2 weeks prior to acupuncture did not improve the lesion. In fact, this lesion worsened during the intervening period. In contrast, the smaller lesion on Phoebe’s head could not be successfully treated with acupuncture due to the patient’s protest of these needles in her line of sight. The larger dorsal lesion, which acupuncture was performed on, resolved faster than the smaller lesion on her cranium. 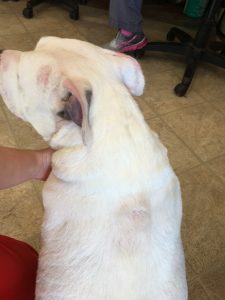 Phoebe’s pyoderma and malassezia pachydermatis resolved with Cephalexin treatment for 8 weeks, Ketoconazole treatment for 4 weeks, long term antihistamine use, and acupuncture/laser therapy. Antibiotic, antifungal, and antihistamine treatment prior to acupuncture/laser therapy only mildly decreased Phoebe’s pruritus. Phoebe’s case is different than other cases describing calcinosis cutis because she did not have hyperadrenocorticism. All dogs with hyperadrenocorticism in one study improved with acupuncture and herbal therapy (Koh, et. al., 2017). Nine of the twelve dogs in the study had general skin changes (including one with calcinosis cutis), and eight of these nine dogs had resolution of these changes following acupuncture and herbal therapy. In a study describing acupuncture and antihistamine use in humans with atopic dermatitis, using the antihistamine cetirizine and acupuncture concurrently had the greatest impact on reducing itch intensity when compared to using either cetirizine or acupuncture as a sole therapy (Pfab, et. al., 2012). Phoebe is currently on cetirizine in addition to having acupuncture to treat her atopic dermatitis. Phoebe did not experience any adverse events while undergoing treatment.